ThirtyFifty is an award-winning wine tasting company offering wine tasting courses and wine appreciation courses in the UK. The wine tastings are led by ThirtyFifty's team of wine experts, including director Chris Scott from time to time. All are qualified to WSET Level 3 or WSET Diploma Level 4 and all experienced wine presenters. For 2018/2019 we have a full diary of evening, day and weekend wine tasting experiences available in different locations throughout the UK. Our Wine Tasting Evenings are available in London, Bristol, Cardiff, Liverpool, Manchester, Sheffield, Birmingham, Leicester and Norwich and our Saturday One Day Wine Courses are run regularly in London, Bristol, Cardiff, Cheshire, Edinburgh, and Buckinghamshire. The One Day Wine Course can also be booked as part of a Wine Tasting Weekend at several hotels in the UK. Prices are £39 per person for the Introduction to Wine, Discovery and Champagne & Fizz evening tastings which includes antipasti or canapés. In London we also run our Friday Wine Tasting Supper Club at £49 per person. Our One Day Wine Course, Discovery Day Course and Champagne & Sparkling Tasting Day, all with a delicious 3 course lunch, are £89 per person. We also have several weekend wine tasting breaks priced from £149 per person including one night's accommodation with dinner and breakfast and the One Day Wine Course. When most of us are offered a glass of wine, we might base our choice on its geographical region, the colour, or even the smell, but few of us go to the lengths of swirling the wine gently to release the appropriate aromatic molecules. It might sound silly, but this really is the best way to release the real scent. Smell and taste are so closely related that if you find a wine you love the smell of; chances are you should love the taste too. Our fully qualified team of wine connoisseurs at ThirtyFifty are experts on how to find and select the best wines. Our wine tasting course advisers can guide you through the properties of any bottle, explaining everything from the optimum temperature to store your wine at, to which type of glass it would be best served in. All our staff are WSET qualified with years of wine tasting experience, and bring all the information and enthusiasm you could want from the host of a wine tasting course. You can also request our director Chris Scott for your wine tasting experience if you wish. With endless knowledge to help you take advantage of our great range of wines on offer, fused with a great sense of humour, it is no wonder we get such good feedback on our wine tasting courses. 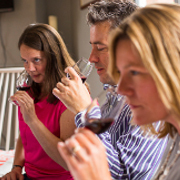 Alternatively, if you can gather together a group of ten or more wine fanatics, we can even bring one of our renowned wine tasting courses direct to your home, where we can include blind tastings and interactive challenges to your wine tasting experience. We love to share our knowledge and our love of wine, so our wine tasting courses can be found in different locations across the UK. Visit us for an evening with friends, for just £35 or maybe treat your partner to one of our one day courses, where you can try an impressive 18 wines from around the globe, with a three course lunch, for £89 in London and UK locations. Many who visit our wine tasting courses love the experience so much they then go on to book one of our popular wine tasting weekends, mingling with other wine enthusiasts at popular hotels across the country, where meals and accommodation is also included for a reasonable £149 per person. As well as a relaxing break, these recommended visits equip you with useful hints and tips to take away with you. For example, many wine amateurs are not aware of the best way to get clues of a wine’s grape variety through observing the colour, but this can really help you seek out a wine that’s perfect for you. A really interesting lesser known tip that benefits your wine tasting experience is that to get the most accurate judgement of a wine’s colour you should always judge it against a white background. A wine tasting can make the perfect present for a friend or relative. A thoughtful alternative to traditional gifts, we supply gift vouchers that allow you to book a surprise wine tasting course for those closest to you, or if you’re not too familiar with their diary, play it safe and leave your voucher open. ThirtyFifty Gift Vouchers make a great Christmas, birthday or anniversary present or even a gift for father's day or mother's day for the wine lover in your life. They can be purchased for specific dates or left open-dated, valid for 24 months from the date of purchase. We can email open dated vouchers free of charge or post a printed voucher to you for an additional £2. Tamlyn Currin started doing wine classes with Michael Schmidt about five years ago, and then went down the more conventional route by doing the WSET Intermediate and Advanced in 2006. She plans to be writing her final WSET Diploma exams in June 2009. She recently tried out a less formal approach. If enthusiasm and vitality are infectious, Chris Scott (pictured) should be quarantined. I was not entirely sure whether to expect much from an Introduction to Wine and Wine Tasting class in London last month. I left invigorated, and it wasn’t simply owing to the fact that Chris does not feel that spitting is necessary in his particular sessions. The session is packed with humour, but Chris imparts real gems of information under a magnificently covert guise of irreverence. He has strong, and occasionally controversial, opinions (on terroir, for example) but all is made infinitely palatable when balanced with his incisive, wide-reaching knowledge and lack of pretension. He is also deceptively disciplined about managing time, and answering questions without getting too distracted from the task in hand. ThirtyFifty was started in 2002 by Chris and his wife Jane.The name has nothing to do with age but refers to the conventional wine-growing latitudes on either side of the equator – a theme which cropped up several times during the tasting as it became clear that climate is one of Mr Scott’s key preoccupations. They operate from an internet base and hold private tastings, run an online wine shop and do a series of podcasts. A session such as the one I attended is limited to 15 people, which works.The format is simple: two tasting glasses, a sheet listing the wines (seven in total), an unused spittoon and a nifty crib sheet of key characteristics for major grape varieties and other useful bits of information. For this session (the first of three), there were four whites and three reds, with one of each served blind. We tasted wine from England, France, Italy, South Africa, Chile and Australia. Chris gets people to score wine on a 5-point scale, based purely on personal enjoyment: 1 = not to my taste, 4 = a pleasure to drink, 5 = outstanding. This gives him an idea of what sort of wine people like, and the universally panned wines do not get picked for tastings again. If this class was anything to go by, ThirtyFifty has a good formula – it’s a fun, unpretentious social event that is actually very rich in useful, interesting information. Chris covers a broad range of topics but keeps the focus on key aspects such as the structure of the wine, regional influences and climate. He encourages discussion and questions, and selects some good wines. I’d go again.